When my daughter was in her teens, we watched the mini-series, Anne of Green Gables starring Megan Follows. It was a delightful, perhaps even enchanting series based on the book with the same title. We both loved the shows so much that I purchased them on VHS so we could watch them over and over again, which we did. We spent many wonderful weekends watching Anne experience childhood and young adolescence. Megan Follows made the storybook Anne come to life. She made her lovable! I was really excited recently when "Anne with an E" was released on Netflix. I expected another wonderful show, but I was greatly disappointed. As a matter of fact, I wouldn't recommend this new Netflix series. However, that series did make me long for the less "jaded" Anne played by Megan Follows. I immediately ordered the DVD's of Anne of Green Gables starring Megan Follows and I spent the weekend watching and remembering the beautiful story written by Lucy Maud Montgomery back in 1908. If you want to meet Anne, look for Megan! She plays the part beautifully and leaves us wishing we could all adopt Anne. Anne of Green Gables: Collector's EditionFor those of you who have not seen or read Anne of Green Gables, I'll give you a brief description of the story. For those of you who are familiar with Anne, I'll remind you to watch and read again. Anne Shirley is an 11 year old orphan who is mistakenly sent to live with Marilla and Matthew Cuthbert. Because he was getting older, Matthew and his sister Marilla decided he needed a boy to help him care for their farm. It was quite the surprise when Matthew arrived at the train station to pick up the boy and he discovered a little girl instead. He wasn't quite sure what to do with Anne, but he knew he couldn't leave her at the station overnight, so he took her home. On the wagon ride back to the farm, Anne talked none stop about how happy she was to be adopted. How hard her life had been when she was placed with other families over the past few years. She had pretty much won Matthew's heart by the time they got home to Green Gables. Marilla was equally shocked when Matthew arrived with a girl instead of a boy and was determined to send her back as soon as possible. After all, she didn't need a girl. At least, she didn't think she needed a girl. When Marilla and Anne went to visit the woman who had brought Anne from the orphanage, the woman recommended giving her to another mother who had 11 children and needed help. That would have been Anne's worst nightmare and even Marilla wasn't too thrilled with that suggestion. She ended up taking Anne back to Green Gables on a trial basis. There were many adjustments for Anne, Marilla and Matthew. Throughout the show, Matthew is Anne's champion. And, while it may have seemed that Marilla was harder on Anne, she certainly did her fair share of defending Anne any time she did something embarrassing or wrong. Anne excels as a student, but she is very imaginative and feisty. She manages to get herself into a number of predicaments that make you smile at her temerarious and determined ways. One my favorite scenes, which exemplifies her personality perfectly, is when Gilbert Blythe pulls her hair braid and calls her "carrot". She promptly jump out of her desk seat, grabs his student chalkboard and breaks it over his head. 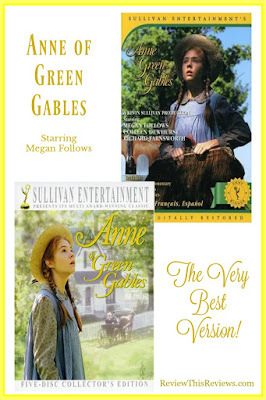 I highly recommend the Anne of Green Gables DVD series starring Megan Follows to anyone. Just make sure you get the right one! I am not the only Contributor on Review This that loves Anne of Green Gables. Brenda Little, aka Treasures by Brenda, has previously written several articles on the book. Your review makes me want to go back and watch the Anne of Green Gables series. I have always enjoyed it. Can you believe I have never watched the Anne of Green Gables movie? I MAY have read the book as a young girl, but cannot remember now (in my advanced years...LOL). After reading your review, I most definitely want to now do both -- read the book and watch the movie. Thanks so much for the reminder. Probably because I had boys and not girls, I haven't watched the Anne of Green Gables movies or (gasp!) read the books, either. I'm sure I'd enjoy them for myself, though. I've had a lot of reading and watching time available, so hopefully I'll get to these soon. Love the review! I have not seen the movie but the original book is delightful and when visiting Prince Edward Island a few years back we saw all the Anne of Green Gables sites and I bought my granddaughters Anne dolls. I'm very ashamed to say that I've never read nor watched this! For a relaxing night, I plan to get with the program and get this classic watched. I absolutely loved the Anne of Green Gables books. I don't normally watch movies or DVD's but I happened to see some of these when we were visited friends with our children decades ago. I probably wouldn't want any other version of Anne.